The date was July 25, 1956. The place was the world-famous Copacabana nightclub in New York City. Dean Martin, the suave, smooth, baritone singer and his hilarious comedy partner, Jerry Lewis, were about to go onstage for the 2:30 a.m. show. It was to be their last of three shows that night, and also the final appearance of the most popular comedy team in the history of show business at the height of their fame. After exactly ten years together as a team, the pair had made 16 profitable movies, hosted a very successful TV show, and were the #1 nightclub act in America. But why would such a hugely successful partnership possibly want to split up? The common perception was that “Dean was lazy”. He wanted to play golf and relax, and Jerry was a fiercely-driven workaholic, never wanting to stop performing. And there was some truth to this theory. But the heart of the matter was much deeper. Dean Martin was, quite simply, sick and tired of being known as “just another straight man”, and even “a stooge” for his extremely talented partner. Dean had grown to hate the Martin and Lewis films, claiming he played “an idiot” in all of them. The plot was pretty much always the same: Dean sang a song or two and got the pretty girl, while Jerry got all the laughs and was usually the central character. The reviews for boys’ movies, TV shows and nightclub appearances were startlingly similar. While all the critics raved over Jerry’s brilliant comedy, Dean was mostly looked upon as a marginally talented after-thought. During this last engagement at the Copa, a bit of hidden anger possibly came to the surface, as during one of their comedy routines, Dean slammed his foot down on Jerry’s with the force of a piledriver. Dean would later tell the press, “It was an accident.” Jerry had to perform in bedroom slippers for the next several performances. But now it was time for the end. Just about every major celebrity in show business was there- it was to be the biggest night in the glorious history of the Copacabana nightclub. Before Dean and Jerry came onstage, the beautiful Copa showgirls danced across the stage in the introduction routine. 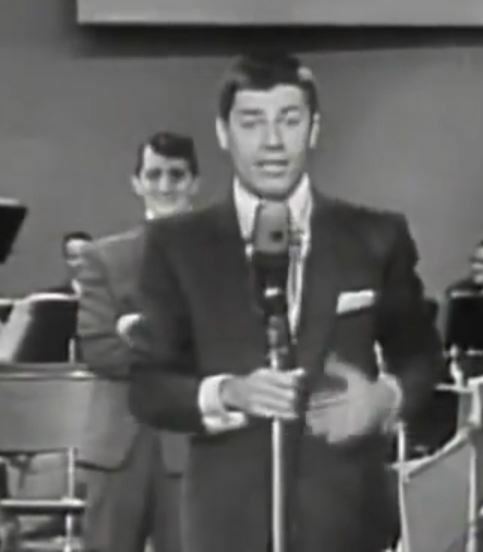 Jerry, as usual, came onstage first, did his comedy shtick, and introduced “my partner, Dean Martin”. Dean did his usual three songs. Then the two tore up the place with their hysterical act- Dean attempting to sing and being interrupted by Jerry; Dean standing off to the side while Jerry mugged, and Dean playing straight man while Jerry got most of the laughs. 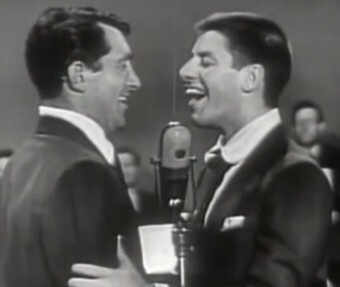 Unlike other stage acts who played out to the crowd, Martin and Lewis were unique, in that they “played to each other”. The two, as always, broke each other up. “I knew 90% of the audience was looking at Jerry”, Dean was to later lament about the partnership, but who could argue with this kind of success? The money was pouring in by the millions at a time when that meant even more than today. More clowning, more singing, the boys did some impressions- big laughs, big yocks from the crowd. And finally- the end- the two sang the song “Pardners” from the previous movie they’d appeared in. The crowd went berserk, applauding, whistling, roaring, standing. Dean and Jerry wept openly and gave each other a hug. Jackie Gleason jumped up onstage and dramatically said “Folks, this can’t be allowed to happen!” More applause. Jerry reportedly cried hysterically in his dressing room. Dean came in and the two cried in each others arms. Finally, they shook hands and wished each other luck. The general consensus was that Jerry really was devastated by the split, but Dean was actually a bit relieved and anxious to move on to a new, solo phase of his career. Jerry Lewis would go on to be the most popular comedy movie star of the 1950s and the early 1960s- and, of course, he was to be recognized as the great crusader for muscular dystrophy. And despite “everyone’s predictions” to the contrary, Dean Martin was to go on to make many excellent movies, host a hugely successful TV show, and become a giant star in his own right, finally. Sadly, there barely exists any footage of the legendary nightclub act of Dean Martin and Jerry Lewis, relative to how much they performed. Yes, their wonderful films are still there- and they are awesome- but anyone who actually saw Dean and Jerry live say they were one of the funniest stage acts in show business history. True, Dean and Jerry both had legendary solo careers, but as with the Beatles, “The whole was greater than the sum of it’s parts”. Why were Martin and Lewis so successful? 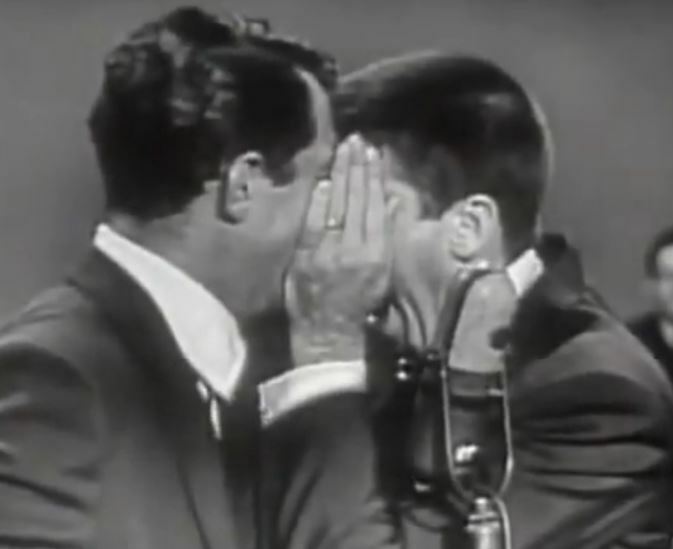 Well, Jerry Lewis, when asked the secret of their huge success, always gave more or less the same answer: “It was the love we had for each other. You could have given any other two guys the same material and they wouldn’t have made a nickel”.